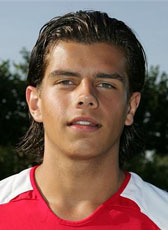 Jordy moved abroad from Ajax A1 to Liverpool in January 2007. He was on a youth contract at Ajax before signing for the Anfield club until 2011. The target man was a key member of the title-winning reserve team of Liverpool in 2007-08 but he made no minutes for the first team. However, after good performances at the Reserves, he was allowed a loan-move back home to RKC Waalwijk in January 2009. He made his first team début but played because of injury problems just five matches without scoring in the second half of the 2008-09 season. In winter 2010-11 he returned home signing for 1,5 season at his home town club ADO Den Haag. He left Liverpool cancelling his contract until 2011. In October 2011 he decided to cancel the contract in mutual consent with the club. Brouwer did not train for a while with the first selection and the club was not seeing any future in Brouwer for first team football. Since December 2011 he was training at Almere City FC who offered him a contract for the rest of the 2011-12 season in February 2012. In the 2012-13 season he returned to the amateurs of his birthplace Den Haag. He joined HBS who are playing on fourth tier Dutch football. Brouwer moved in summer 2013 to the amateurs of DHC Delft.